You will come across several file types, while working with MADRIX. This chapter explains which file type belongs to which function or which part of the software. Your whole show will be saved. It stores relevant data in one single file; including but not limited to Patch, effects, settings, Cue List, images, etc. Note: Videos will not be included in this file, for example. Note: The madrix.mflx is being overwritten with an updated version every time a new MADRIX version [software update] is installed. Furthermore, MADRIX supports every image and video type that is supported by your Windows PC. In most cases, a specific video codec needs to be installed on your computer. Examples: *.avi, *.mpg, *.mov, *.wmv, *.asf, *.divx, *.vob, *.flv, etc. If you are encountering problems using such files, please install the required video codec or image codec on your PC. ▪ Load Patch - Will load the pre-defined virtual matrix and Patch settings from this Setup. This overwrites your current Patch. If you deselect this option, your current Patch will be used. ▪ Load Group Control - Will load the Group Control from this Setup. This overwrites the current Group Control. If you deselect this option, your current Group Control settings will be used. ▪ Load DMX Device Settings - Loads all settings regarding DMX devices from this Setup. This can overwrite your current settings. 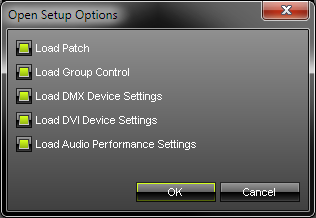 Deselect this option if you have configured your own DMX settings. ▪ Load DVI Device Settings - Loads all settings regarding DVI devices this Setup. This can overwrite your current settings. Deselect this option if you have configured your own DVI devices settings. ▪ Load Audio Performance Settings - Loads all settings regarding audio this Setup. This can overwrite your current settings. Deselect this option, if you wish to keep your own audio settings.